"We first came to know the Tainan Enterprise Culture and Arts Foundation through the breathtakingly beautiful Barclay Memorial Park that runs alongside our school," an entry on the website of Tainan Municipal Chongming Elementary School reads. The park's pathways are routes to and from school for these kids, and it also serves as an outdoor classroom for ecological studies. On summer nights one can even watch fireflies tracing their balletic course through the inky night. "This is his signature work," laughs Tainan Enterprises Co. Ltd. general manager Cathy Yang, pointing at Tainan Enterprise Culture and Arts Foundation CEO Yeh Chong-li. Eight years prior, local ward chief Lee Jen-tze had organized teams of volunteers to clean up what had earned the unflattering sobriquet of "Trash Mountain Park." Shortly thereafter the foundation became involved, combining its park adoption program – entailing "one construction project and one event per year" – with the concept of city marketing to promote the park on the international stage. "My role is that of a soldier – sweat and hard labor. Mr. Yeh's role is that of a literati. All the software features and events in the park are his brainchildren," Lee Jen-tze explains with a chuckle. A review of records of activities through the years, which have included a firefly release program, reconstruction of park walkways, and ecological surveys, shows the foundation behind the scenes, quietly moving things forward. In 2007, Barclay Memorial Park won the FIABCI's (International Real Estate Federation) prestigious Prix d'Excellence gold medal recognizing outstanding global public architecture and construction. Having got its start in Tainan, the company is dedicated to helping the city reach new heights. For a long time Tainan Enterprises has been involved in helping preserve Tainan's ecology and cultural assets. In addition to the well-known Barclay Memorial Park, Tainan Enterprises also planned and adopted the Anping Lakeside Water Bird Park, located within Taijiang National Park, which has earned a reputation as an "ecological Venice" for its myriad network of waterways. As a medium-sized enterprise, the company was limited in scale, and CEO Yeh Chong-li was keenly aware that the foundation would actually need to play the role of a platform drawing various forces together. 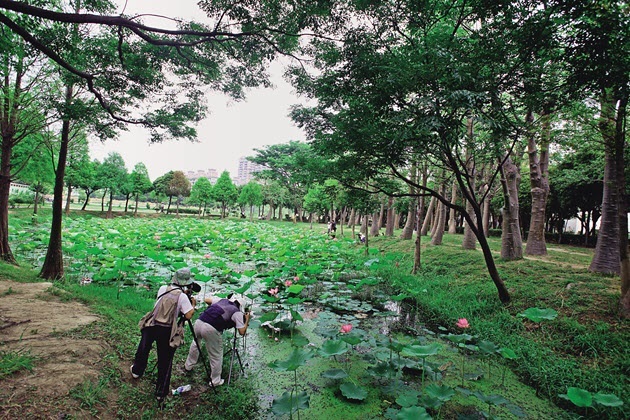 Tainan Community University, the Society of Wilderness, the Wild Bird Society of Taiwan and painter Yusun Cheng were all big contributors in bringing the park back to life. "Now we're adopting our third park, Maxwell Memorial Park," Yeh says, and no sooner have the words escaped his lips than GM Yang asks with surprise: "Another one?" erupting with laughter when she learns of the foundation's endeavors. Having just completed a review of the park facilities, they are holding a forward planning meeting at the end of July. Because the Evergreen retirement apartments are located right next to the park, the crux of the plan for the foundation's operations next year lies in providing support and care for elderly citizens. "We want to sway the government's way of thinking – projects can be accomplished in ways like this," Yeh says opening a map. The map shows areas where the foundation has gotten involved in preserving Old Quarter neighborhoods. In the future their hope is to link these cultural assets together and, with a little work and finesse, transform Tainan into a world-class cultural district. "We're almost doing the government's job for them, organizing all these cultural assets," GM Yang says only half-jokingly. "These activities have subtly helped to form a corporate culture, letting our employees know what the company's doing, and what it cares about the most," she says. Yang believes that even though most of the company's factories have relocated offshore, it still maintains a special bond with Tainan, where its roots lie. Because of its commitment to its old Tainan workers, it retains a 250-staff factory in the city, and through the foundation, it is expanding its scope of involvement into the cultural and ecological preservation of Tainan. Next, the foundation plans to promote the rejuvenation of the Yanshui River watershed, organize a national-grade historical and ecological exhibition, and create more world-class tourist spots in Tainan. Tainan Enterprises could all but lay claim to the title of "underground" Bureau of Cultural Affairs and Tourism. The beauty of Tainan today owes a true debt of gratitude to Tainan Enterprises for the behind-the-scenes role they have played. Plant outfitted with CSR department to deal with such issues as safeguarding employees' safety, human rights, health and welfare benefits. Undertook long-term adoption/maintenance of Barclay Memorial Park and Anping Lakeside Water Bird Park, providing impetus to the effort to establish Taijiang National Park, the newest national park in Taiwan. Environmental protection measures extend to overseas facilities, such as water quality testing and switching to LED bulbs.